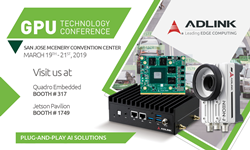 ADLINK will be demonstrating how AI transforms edge applications with series of plug-and-play AI, heterogeneous computing platforms at the GPU Technology Conference (GTC), March 19-21, at the San Jose McEnery Convention Center in Booth #317 and Booth #1749(Jetson Pavilion). ADLINK is uniquely qualified to bring NVIDIA Quadro GPUs with GPUDirect, NVIDIA Video Codec SDK, custom firmware and longevity support into embedded applications, enabling them to tap the power of embedded graphics and AI. ADLINK Technology, Inc., a global provider of advanced edge computing products, will showcase a series of plug-and-play AI and heterogeneous computing platforms at the GPU Technology Conference (GTC), March 18-21, 2019, at the San Jose McEnery Convention Center in Booth #317 and Booth #1749 in the Jetson Pavilion. ADLINK’s heterogeneous computing platforms consist of GPU board, system, and server-level products, enabling system architects to construct and optimize applications for both AI inference and training applications. With intelligence moving to the edge, ADLINK’s heterogeneous computing platforms with plug-and-play AI can perform real-time streaming of data between edge devices and systems, enabling faster and better decision-making. “ADLINK is taking embedded computing to the next level with GPUs. As an NVIDIA Quadro Embedded Partner with extensive experience in embedded applications, ADLINK is uniquely qualified to bring NVIDIA Quadro GPUs with GPUDirect, NVIDIA Video Codec SDK, custom firmware and longevity support into embedded applications, enabling them to tap the power of embedded graphics and AI,” said Elizabeth Campbell, general manager for ADLINK Americas. A portfolio of heterogeneous computing platforms and configurable industrial PCs with NVIDIA Quadro embedded solutions optimized for AI at the edge. An automated optical inspection (AOI) application, based on ADLINK’s industry leading heterogeneous computing platform with NVIDIA Quadro embedded GPU. AI-accelerated PCIe frame grabbers for industrial vision applications, fast implementation without no component changes required. A highly configurable, scalable and serviceable AI training platform with workload optimization capability, designed to enable AI/machine learning/deep learning applications with varying processing requirements. ADLINK’s latest multi-access edge computing server, designed to meet the requirements of ultra-low latency, high bandwidth, real-time access to 5G radio networks. ADLINK and partner, Charles Industries, a leader in telecom approved outdoor enclosures, wireless cabinets and concealment solutions, will demonstrate the Charles Micro Edge Enclosure (CMEE), the industry’s first outdoor pole mounted 5G compatible AI MEC solution, that is GR-487 certified with integrated power and cooling. A rugged deep learning inference platform based on NVIDIA Jetson TX2, demonstrating complex traffic monitoring and analytics at the edge. An AI-enabled smart camera powered by Jetson TX2, performing object detection and classification in outdoor or factory settings. A fanless robot controller taking advantage of server-class performance of Jetson AGX Xavier to enable autonomous navigation in automated mobile robots (AMR). In addition to its large variety of heterogeneous computing products, ADLINK offers consultancy services to help users determine the right platform to cost-effectively fulfill their applications needs. Please stop by our booths or visit our website at http://www.adlinktech.com to find out more about our existing deployments and how we are leading edge computing. ADLINK Technology is a global leader of Edge Computing with a mission to reduce the complexity of building IIoT systems. ADLINK provides hardware, connectivity, and software to form complete IIoT solutions for industrial automation & manufacturing, networking & communications, healthcare, infotainment & retail, transportation, and government & defense industries. Our complete IIoT solutions include embedded building blocks and intelligent computing platforms, fully featured Edge platforms, data connectivity and extraction devices, secure software for data movement, and micro services to monitor, manage, and analyze data-streaming assets and devices. ADLINK is a Premier Member of the Intel® Internet of Things Solutions Alliance, closely collaborates with NVIDA to bring AI to the edge, and is active in several standards organizations and interoperability initiatives, including PCI Industrial Computer Manufacturers Group (PICMG), Standardization Group for Embedded Technologies (SGeT), Open Fog Consortium, European Telecommunications Standards Institute (ETSI), Open Compute Project (OCP), Eclipse IoT, and ROS-Industrial Consortium for robotics. ADLINK products are available in over 40 countries across five continents with a worldwide distribution network. ADLINK is ISO-9001, ISO-14001, ISO-13485 and TL9000 certified and is publicly traded on the TAIEX Taiwan Stock Exchange (stock code: 6166).